In addition to congee, wonton noodles and dim sum, there are a few other things we crave while on vacation. 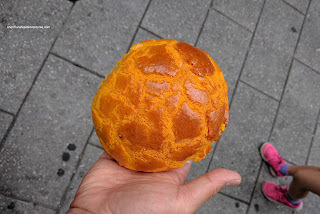 One in particular is Chinese baked buns and pastries. 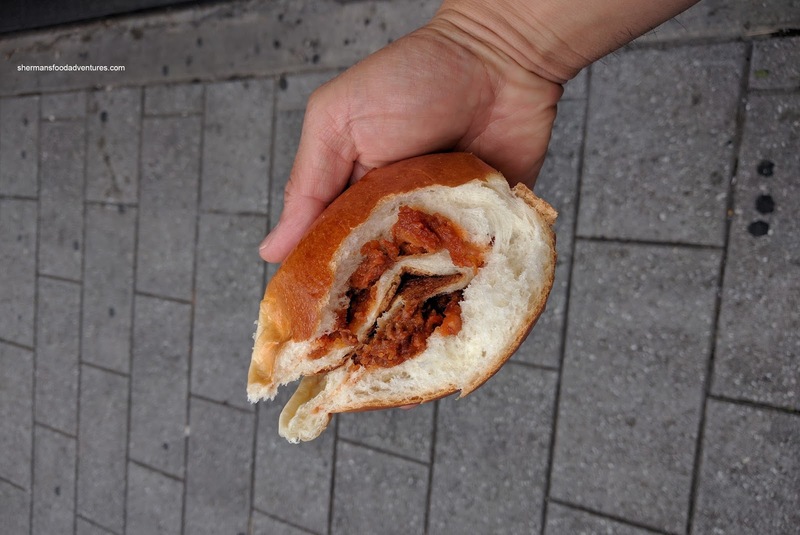 Call it another one of our comfort foods, but really, we need BBQ Pork Buns to survive! As much as our kids enjoy hamburgers, pasta and grilled cheese sammies, they still have some Asian left in them... LOL... So before our day in Old Montreal, we sauntered over to Pâtisserie Harmonie which was in nearby Chinatown. We did indeed get BBQ Pork Buns since that is one of the standards that all Chinese bakeries are judged. Well, they surprisingly passed with flying colours. 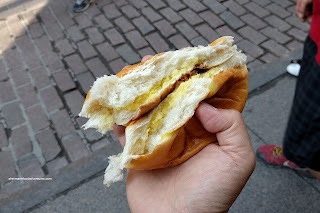 Fairly large in size and exhibiting a good filling-to-bun ratio, this ate well. The pork was lean and the sauce was balanced. I found the bun to be light and airy while not dry. This was more than decent. It goes without saying that the Custard Bun shared the same qualities. The picture doesn't show it, but the bun was equally airy. It got squashed as we were ripping it apart. 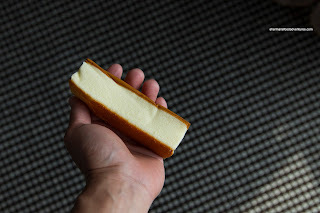 Inside, the custard filling was a bit meager though. It wasn't too sweet and could've been lighter. Another bun we just could not leave without was the Pineapple Bun. Again, there are no pineapples used to make this, rather, the crispy sugar topping "looks" like the outside of a pineapple. Like the other 2 previous buns, this was also good. As evidenced in the picture, the topping was uniform and covered the entire bun. It was medium-thickness and crispy. With the same airy bun, this impressed the kiddies (as well as the adults). 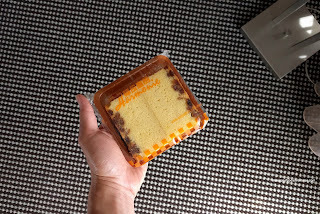 Onto something other than buns, I decided to try their Sponge Cake. It was more or less a typical version which was neither very airy nor too dense. It was lightly sweet and eggy. Moving onto something more robust, I also got some of the Walnut Cake which was predictably more dense and a little more sweet. It was "wetter" too, but not in a bad way. This was pretty filling compared to the sponge cake. 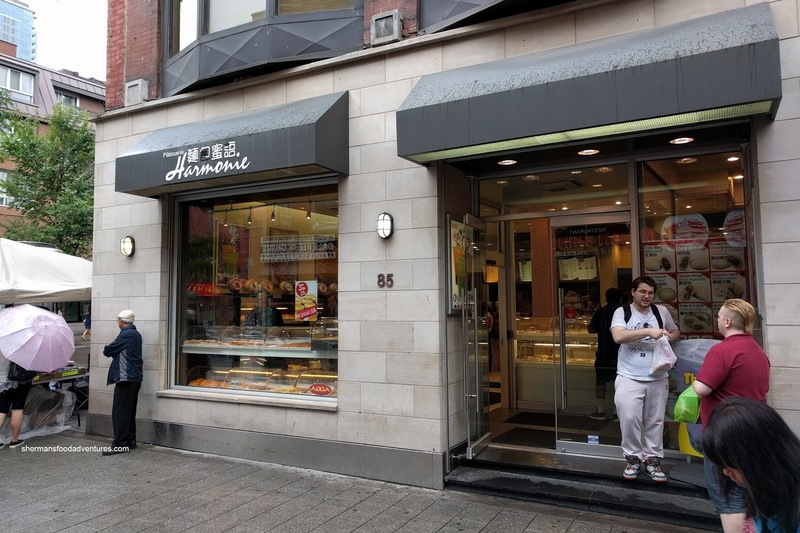 Overall, we thought the things we tried at Pâtisserie Harmonie to be more than serviceable. In fact, we thought they were above-average and comparable to Vancouver/Richmond. 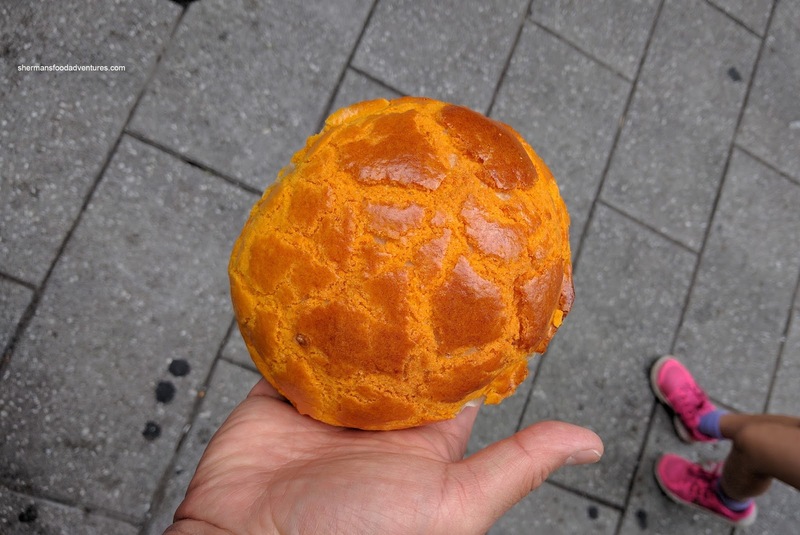 A real nice find in Chinatown and close to our hotel!